Until the Academy Award winning film “Milk” was released, Harvey Milk was not very well known outside San Francisco. For the upwards of 500,000 who have traveled to San Francisco this weekend for the annual Gay Pride Celebration, it was almost certainly “required viewing” and they will find a very familiar looking city since it was filmed entirely on location. 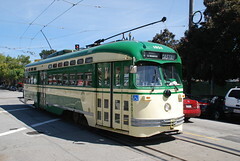 Some may even get to ride one of the film’s props, the green and cream colored streetcar which appeared in a scene were protestors marching to City Hall and can be found nearly every day on the F-Market & Wharves historic streetcar line. Streetcar No. 1051 turning at the corner of Noe & Market, one block from Castro. Jamison Wieser Photo. “Milk” focused on Harvey Milk’s gay rights activism, but if all he had was the gay vote he wouldn’t have likely won a seat on the Board of Supervisors. Harvey was interested in every issue that affected his district, from school closures and child care to dog poop. He also championed public transit, being the first district Supervisor to ride Muni every day using the then-new monthly FastPass. That is an issue close to our hearts at Market Street Railway and even if it’s not what he’s best known for, we think it’s important we remember him as for that part of his persona as well. Several years ago, Market Street Railway president Rick Laubscher had put forward the idea of dedicating one of the San Francisco streetcars to Harvey and when the preview trailer for Milk was released last year including the scene with streetcar no. 1051 it was the perfect opportunity. We contacted the Castro’s Supervisor, Bevan Dufty, who loved the idea. When we made the announcement at our board meeting, a long-time Muni employee in the audience spoke up, sounding choked up as he declared Harvey Milk was the strongest advocate Muni has ever had on the Board of Supervisors. We saw the same sentiment from everyone who Market Street Railway worked with at the SFMTA and City Hall to make this dedication and onboard memorial happen. For those who’ve only recently come to know about Harvey Milk as a LGBTQ rights pioneer, we hope a ride onboard no. 1051 would be a chance to learn more about this multi-faceted hero. Category Features | Tag 1051, Harvey Milk, Harvey Milk streetcar | Bookmark the permalink.